E3 Canine (Fresh-Frozen) is 100% guaranteed. Note: 3 tsp is about 1/2 ounce. Keep frozen until ready to use, then place bottle in refrigerator to partially defrost. For immediate use, place bottle in cool water for 15 minutes. When defrosted, E3 Canine AFA Fresh Frozen Superfood must be kept cold and refrigerated. Shelf life in refrigerator is 7-10 days. 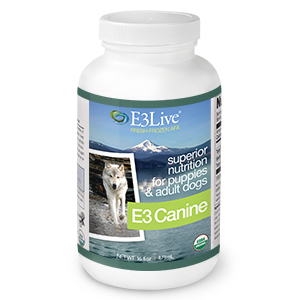 E3 Canine (Fresh-Frozen) has over 65 vitamins, minerals, amino acids and essential fatty acids. E3 Canine Fresh-Frozen AFA Superfood is a liquid – the most potent and powerful form of AFA. E3Live is the only company to offer AFA in this fresh frozen form. We also offer E3 Canine in a dry powdered form (50g or 150g). To ensure E3 Canine (Fresh-Frozen) arrives in its freshest state, we ship in quantities of 6 or more — we've found a minimum of 6 bottles keeps your E3 Canine (Fresh-Frozen) optimally cold during transit to your door.